Running a traditional kopitiam that appeals to customers from all races was a concept that Wong Kok Peng had hoped to achieve when he opened his shop, simply called Kopitiam, more than 10 years ago. Wong, 53, had dream of running a kopitiam after quitting his freelance photography business, but he did not want to limit his customers to a certain group of people. His dream has come to fruition as can be seen from those who patronise his shop. They are people of various races. Perhaps what makes his restaurant different from the traditional Chinese kopitiam is that he ensures that all food served there are halal to cater to Muslim customers. Wong still uses the old style ceramic coffee cups and saucers but has opted for round wooden tables and plastic chairs instead of marble-topped tables and wooden chairs found in traditional kopitiam. 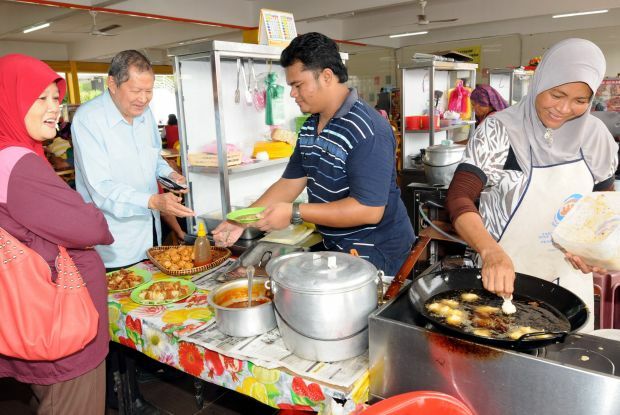 He started his business in 1990 and his first kopitiam outlet was at Kompleks Alor Setar in Lebuhraya Darulaman. He then shifted his business to the former SMK Convent building in Jalan Teluk Wanjah in 2005 before moving his business to the current location at Ukir Mall Complex in Jalan Sultan Badlishah last year. Wong said his menu had never changed over the years. He still serves kaya and butter toasted bread, half-boiled eggs and his specialty, KCK toast (half-boiled egg served on toasted bread) with drinks. “The KCK toast came about after a regular customer made the same order each time he came for breakfast. The item was named after the man,” he said at his shop recently. Delectable: Wong showing a set of Roti KCK at his coffeeshop. Wong’s kopitiam, which he runs with his wife, is open from 7am to 8pm daily except during the fasting month of Ramadan and the Hari Raya Aidilfitri and Chinese New Year holidays. “People have asked me why I close during Ramadan. It is to show my respect to Muslims who are fasting. 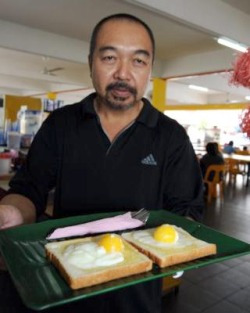 My shop has always been closed during Ramadan since I started my business,” Wong said. He said he opened his kopitiam to tenant traders from the beginning to provide a variety of food choices for customers. He said he had five tenants operating stalls at his kopitiam when he first started in 1990. The number increased to 10 when he moved to Jalan Teluk Wanjah and 17 at his present premises. Wong said the tenants rotated their off days and operating hours, with some of them operating only in the mornings and others in the evenings. He said the items they sold included traditional kuih, Arab food, Western food, nasi kerabu, chapatti, yong tau foo, nasi lemak and roti canai. The kopitiam also has, among its tenants, a franchise of the famous Mee Abu which is well-known in the city. Wong, who is a father to two children aged 17 and 16, said his kopitiam might not have many traditional elements as old Chinese kopitiam but the feeling that he hoped to bring with it was nevertheless the same. Nur Farahin Yusuf Ahmad, 21, said she always patronised Wong’s kopitiam due to its quick service and friendly atmosphere. “The service is quick despite the large number of customers at the shop every day. I really enjoy the many choices of food that the shop has for breakfast,” said the private college student. Ahmad Shahir Kassim, 38, also said the variety of food at Wong’s kopitiam was the reason he patronised the restaurant. “The added bonus is that the shop opens every day, including Friday when most food stalls and restaurants are closed,” he said.